Phil Jimenez is an award-winning writer and artist who has worked for DC Entertainment, Marvel Entertainment, and a host of other comic book companies for over 30 years. Best known for his work on TEMPEST, NEW X-MEN, WONDER WOMAN, INFINITE CRISIS, DC:REBIRTH, and his upcoming graphic novel HISTORIA, written by Kelly Sue DeConnick, Jimenez has also worked for film, television, toy companies, design firms, as well as for museums and universities. Jimenez also teaches life drawing and comics art at the School of Visual Arts in NYC. 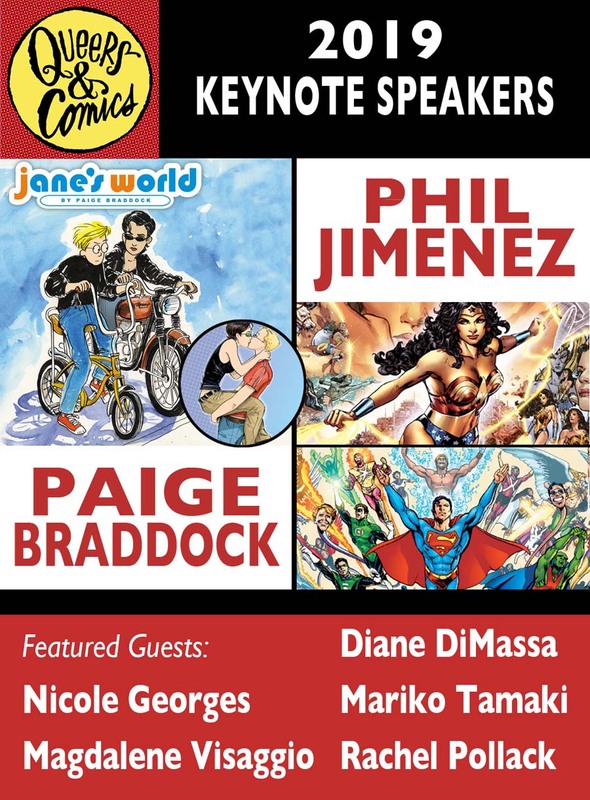 Paige Braddock is best known for her Eisner-nominated comic strip, JANE’S WORLD, the first gay-themed work to receive online distribution by a national media syndicate in the US. Braddock released an anthology celebrating the comic’s 20th anniversary in August 2018, LOVE LETTERS TO JANE’S WORLD, published by Lion Forge. Braddock published the first novel inspired by the comic series in 2016 with Bold Strokes Books. By day, Braddock is the Chief Creative Officer at Charles M. Schulz Creative Associates. She has illustrated several PEANUTS books, as well as numerous other comics and children’s books. Diane DiMassa I am the creator of the foul-mouthed and over-emotional nut job Hothead Paisan, Homicidal Lesbian Terrorist which debuted in the early 90’s, and from which I still enjoy a cult of nut job fans. I have contributed to countless zines, anthologies, cartoon jams, art shows, and have done many presentations at colleges and bookstores. I have always found cartooning to be a great medium with flexibility and freedom allowing one to create their own world, and cartoons are immediately accessible and appeal to a wide range of creatures. I have watched the stable of queer cartoonists grow and expand into huge numbers, and am proud to now be an elder. So you better respect me. Nicole J. Georges is a writer, illustrator, podcaster & professor from Portland, OR. Her Lambda Award winning graphic memoir, Calling Dr. Laura, was called “engrossing, lovable, smart and ultimately poignant” by Rachel Maddow, and “disarming and haunting, hip and sweet, all at once” by Alison Bechdel, author of Fun Home. Nicole’s latest book, Fetch: How a Bad Dog Brought Me Home, is the recipient of 2 Oregon Book Awards, and a Lambda nomination for best Graphic Novel. She does the queer art podcast Sagittarian Matters, and teaches at California College of the Arts’ MFA in Comics Program. Rachel Pollack is a science fiction author, comic book writer, and expert on divinatory Tarot. She is the first openly trans woman to work in the mainstream comics industry, creating the first trans superheroine in the pages of DC Comics’ Doom Patrol in 1993. She has won the Arthur C. Clarke Award and the World Fantasy Award and been shortlisted for the Nebula, James Tiptree, Jr., and Lambda Awards for her science fiction books. She has written non-fiction books and essays on such subjects as the Kabbalah, Goddess Worship, and Tarot, as well as created her own Tarot deck with author Neil Gaiman and illustrator Dave McKean. She teaches Creative Writing at Goddard College. Mariko Tamaki is a Canadian artist and writer. She is known for her graphic novels Skim, about a teenage girl who has romantic feelings for her female teacher, Emiko Superstar, and This One Summer. In 2016, she began writing She-Hulk and Supergirl for both Marvel and DC Comics. Magdalene Visaggio is a comics writer and essayist. She’s the writer and creator of the GLAAD and Eisner-nominated series Kim & Kim, as well as Eternity Girl at DC Comics, Dazzler: X-Song for Marvel and Transformers vs. Visionaries at IDW Publishing.